Since 1971, Starbucks Coffee Company has been committed to ethically sourcing and roasting the highest quality arabica coffee in the world. Today, with stores around the globe, the company is the premier roaster and retailer of specialty coffee in the world. To share in the experience, please visit us in our stores or online at www.starbucks.com. Contains 4 plastic gift cards. 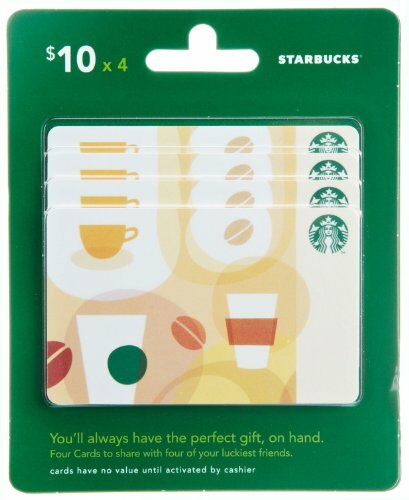 Starbucks Cards redeemable at most Starbucks locations. It's a great way to treat a friend. Why We Love This Gift: Coffee. Fancy coffee. Conversation. What To Express in Your Card: Thinking about you and hoping you might have time for a coffee? Tea? How about Monday?